Once the cold winter weather sets in, the last thing you feel like doing is taking your little one outdoors to play. You may manage to get out of the house for a little while, but when temperatures fall below freezing, it’s safer and much more comfortable to stay indoors. The trouble is, it can be pretty tough to keep your toddler busy during long periods spent in the house. 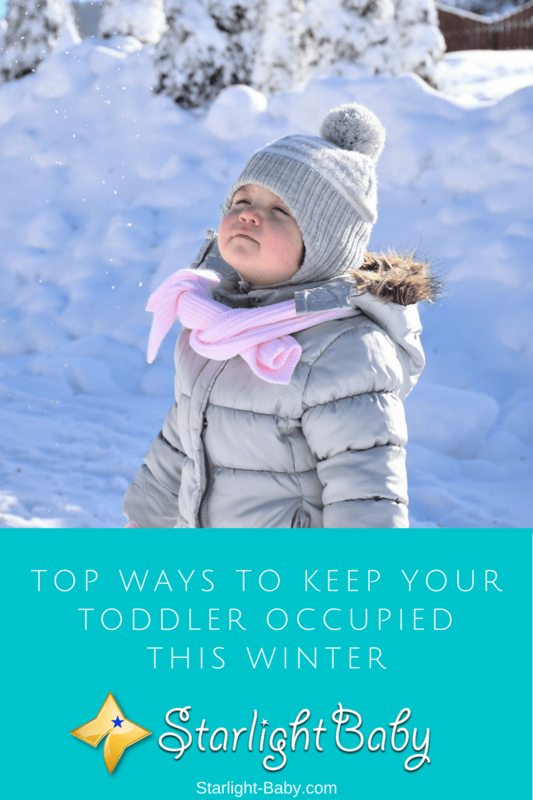 If you’re in desperate need of inspiration to prevent those inevitable meltdowns and retain your sanity, below you’ll discover some of the top ways to keep your toddler occupied this winter. You can rest assured you aren’t the only parent worried about keeping their toddler busy this winter! Therefore, why not join together and set up play dates? Not only does this provide your toddler with friends to keep them entertained, but it also gives you a chance to indulge in some adult conversation too. You could take it in turns with the other parents to host the play dates and potentially even organize a few play dates where the parents get a little time off. So, the parent hosting the play date would watch the children for an hour or two, while the other parent enjoys a little “me” time. Toddlers love to paint, but they’ll love it even more with this clever idea. Simply trace around your little one’s hands and feet, then cut them out. Your toddler can then paint or color the hand and footprints in to look like animals, people or flowers. It’s a super-simple idea, yet it provides your toddler with hours of fun. It also sparks their imagination, which is always a good thing. If you want to really keep your toddler occupied and help them burn off a lot of energy, an indoor play gym could be the answer. You should be able to find at least one in your local area and they’re awesome for getting you and your toddler out of the house, while also providing your little one with the chance to run around. They can also really help to build up your toddler’s essential motor skills. So, just because the weather may not be great, it doesn’t mean you can’t do something fun outside of the home. One of the biggest challenges you’ll face when your toddler is indoors more often during winter, is trying to get your chores done. However, did you know your toddler would LOVE to help out? Even just small tasks like asking them to hold something or fetch you something can help. Toddler’s are keen to help and they like being involved in adult stuff. Chores may be unexciting for you, but to your toddler they absolutely love them. So, enlist their help during the holidays and not only will it be easier to get your chores done, but it will also help to keep your little one out of trouble while you do them. Sensory bins are a great idea all year round. However, they can be especially great for keeping your toddler occupied during winter. Not only are they fun, but they’re also a fantastic learning activity which can help boost your toddler’s fine motor skills, as well as their numbers and counting skills. All you’ll need is 2-3 containers (or more if you want to keep them occupied for hours!). Then, fill each one with something different. You don’t need a massive budget for this one – you can simply use whatever you can find around the home. Your toddler’s toys, dried food, balls, feathers, fake snow and even seashells if you live near a beach. Once they’ve been filled, your toddler can explore each container and play around with them. They’ll enjoy the range of different textures and the noises created as they play with each box. Sensory bins are by far one of the best indoor activities for toddlers. Just because you’re both stuck indoors doesn’t mean you have to miss out on the fun. Throwing balls around in the house wouldn’t be a good idea, but balloons can make an excellent alternative. Why not set up your own little game of balloon tennis? You’ll need to teach your toddler how to throw the balloons, but once they’ve got the hang of it they’ll love this simple little game. Just remember, if a balloon bursts, you’ll need to pick the pieces up straight away. Otherwise, they could become a serious choking hazard for your toddler. A lot of toddlers enjoy pretending to run their own little shop. This is largely because they love pretend play and also enjoy pretending to be adults. The good thing about the grocery game is you can adjust it to fit your toddler’s skill level. You can also provide pretend food and money, as well as a toy grocery register if your budget allows. This idea will literally give your toddler hours of fun and you can use it to help them develop their money and number skills. Who doesn’t love a fort? Even you’ll enjoy helping your toddler to build their own little fort. You can create one out of lots of different things from a simple large cardboard box, to cushions from the sofa. If you’re using a cardboard box, you’ll just need a little duct tape, as well as scissors to cut a door and window into it. The great thing about this idea is that it doesn’t just keep them busy while they play in the fort, but it also provides them with a lot of fun destroying it afterwards. If all else fails, a good way to calm your toddler down is to host “story time”. It would peak your little one’s interest if there was a new book to read, but even just reading some of their favorites will go down well. This feeds their imagination, gives you both a great excuse to bond and helps with their reading skills. The above are just some great ways to keep your toddler occupied this winter. As you can see, there’s lots of great ideas and activities you can take part in, even if you are stuck indoors. Trying to get out briefly each day will also help, even if it’s just a quick walk to the park. Got any other winter activity ideas you’d like to share with other parents? Let us know below!